There have been many films throughout the history of films that deserved to become franchises. When I look at some films that get sequels in this day and age, I am usually crippled with despair. How could so many bad choices become sequels when stuff like "True Lies" or "Big Trouble in Little China" only became one-note affairs? I don't work anywhere near Hollywood and I am not going to pretend like I know anything about the business that goes on there. But I wish I could sit in on some of these meetings, so I could understand how these studios decide sequels. As far as modern movies go, I still can't believe "Beerfest" was not accompanied by "Potfest." I mean after "Beerfest" finished and Team USA ran into Willie Nelson, inviting them into a pot-smoking tournament, then announcing "Potfest" as a movie...it was one of the most disappointing empty promises in movies. I don't know if Broken Lizard still plans to make the movie, I sincerely hope they do. I can't believe that "Beerfest" is barely discussed anymore in modern comedy. Did all of the Seth Rogen and Evan Goldberg and Judd Apatow taint the rest of comedy? Did all the Hangovers and Superbads and Knocked Ups really pave the way for comedy now? Is it really true that anything that doesn't star any of the "Apatow Crew" not matter? All I know was that "Beerfest" was easily one of the most quotable movies of the 2000's. It was one of the most hilarious movies of that decade too, something I saw a couple times in the theater with my friends that year. Everything about "Beerfest" works for me. It has slapstick comedy, it has screwball comedy and it has some offbeat choices that I found gleeful as well. The Broken Lizard had a great decade in the 2000's (think "Super Troopers," "Club Dread" and "Slammin Salmon) and it hurts that more people aren't aware of these guys. The Broken Lizard consists of Jay Chandrashkar, Kevin Heffersan, Steve Lemme, Paul Soter and Erik Stolhanske. 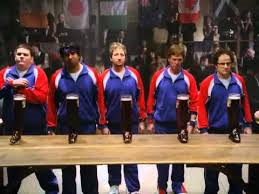 In "Beerfest" they play friends who enter a secret underground Beer Olympics game, featuring drinking teams from all around the world. They are there not only to compete but to clear the name of two member's grandma, who was a top brewer from Germany. They want their grandparents brewery back and they plan to get it. I love the work by each member of the Broken Lizard. I think they each have a special scene in the movie that highlights their best work. I love the cameos by Donald Sutherland, M.C. Gainey and James Roday. I love the hilarious work by Nat Fixon, Will Forte, Eric Christian Olsen, Jurgen Prochnow and Cloris Leachmann. The movie is so rich with performances, that its really hard to narrow down who stands out. That is a wonderful problem to have in a movie. Oh, and does anybody remember Candice Smith from "Survivor: Tocantins?" The first season of Survivor in the year 2009? Yeah, Candice Smith has a role in this, that makes me laugh to think about. "Beerfest" may have a simple story, but its perfect for a comedy. It also helps that the execution of the movie is pretty much flawless. It's great when a comedy embraces its silly premise and when it can get several actors together, passionate to make it count. There is a lot to love about this movie and the Broken Lizard in general. I want more from these guys and soon. Bring on "Potfest" already!